A tool to replace textures in DirectX 11 applications. Aims to do the same thing as uMod tool did for DirectX 9.
ui.log, uisettings.ini, dllsettings.ini files in the "My Documents\Resorep" folder. Dll log file. Its path is specified in advanced settings dialog. To get a dll log - close a game, open Resorep, open advanced settings, enable mod creator mode, enable dll log, launch a game, see resorepDll.log file in the "My Documents\Resorep" folder. Screenshot of contents of a folder with game executable. Please enable table view - I need file sizes to be visible. If you are using Resorep with Black Desert and game is crashing or hanging, prepare a copy of "My Documents\Black Desert\Dump" folder. Spoiler: My game is not working anymore! How to fix it? Many thanks to Lazyeye007 for the list. Click the "+" button in the "Applications to hook" section. [Optional] Change "Load modded textures from" path if you wish. Find and download modded textures (for BDO see the "Where to find modded textures for BDO" section). Unpack and copy modded textures into folder specified by "Load modded textures from" path. [Optional] Change "Save original textures to" path if you wish. To reduce amount of captured textures, wait for the moment when the texture you are going to mod is about to be displayed for the first time. Enable the "Save original textures" checkbox when the texture you are going to mod is about to be displayed for the first time. Disable the "Save original textures" checkbox when the texture you are going to mod was displayed in-game. Open folder specified in "Save original textures to". Find the texture you are going to mod in one of the subfolders. There are different subfolders for different texture compression algorithms. Mod the texture (use Intel(R) DDS Plugin for Photoshop - Intel® Texture Works Plugin for Photoshop* | Intel® Software ). You may change the texture resolution as you wish as long as you keep original aspect ratio. Save the texture to other folder using the same compression algorithm and with mipmaps setting set to "Generate mipmaps". You may add arbitrary text to file name by placing ~ after number in file name and placing text after ~. E.g. "123456789~Example text.dds"
Do not delete the original unmodded dds! It may be required later to autoupdate your modded textures in case of Resorep hashing algorithm change. Now when you have the modded texture use steps from the "For mod users" section. Copy C:\Windows\System32\d3d11.dll to same folder as game's .exe file. Copy dx11proxy64.dll to same folder as game's .exe file. Create dllsettings.txt file in same folder as game's .exe file. Change application_to_hook to path to your game's .exe file (add |BIT64 or |BIT32 at the end depending on application bitness, use |BIT64 if you are not sure). If you have some C/C++/Java skills and willing to contribute - PM me to get access to source code repository (hopefully it will become open source later). If you know any other 64-bit DirectX 11 games, it would be great if you try the tool and post the result. 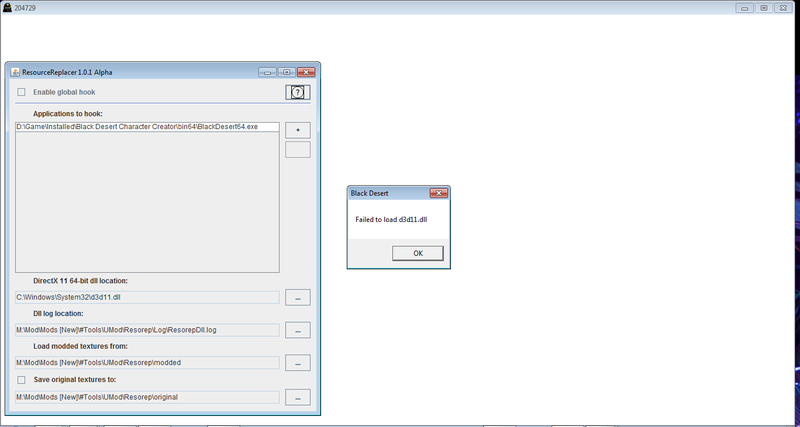 "Fail to load d3d11.dll" during loading of the client when i execute it from the BDO Launcher. Do you have the same error if you launch the BlackDesert64.exe directly from bin64 folder? Just tested it with char creator. Works on my PC. Now need to find out what prevents it from working on yours and fix that. Executed: BlackDesert64.exe recieved message "CommandLineParam"
I need to start it from the launcher. Managed to launch the client (BlackDesert64.exe) thru the launcher, with the Resorep hooked to "BlackDesert64.exe"
Is it the "Save all texture" feature from Umod? cause nothing is being saved when i click on it. When the Save textures checkbox is enabled, application will save all loaded textures into specified folder. But the checkbox has to be enabled before the moment a texture is loaded. You can't get the texture if the checkbox was disabled and the texture is already loaded. Please also verify that the original textures folder contains "DXT1", "DXT5" and "uncompressed" subfolders (it should be created automatically). You may also try to use the path without spaces and special characters for original textures folder. tested it on Planetside 2 64 also but nothing happens there either when i try to "save original texture to"
P.S. You just found a nasty bug - settings related to dll are applied only at the moment an application is added to the hooked applications list. You need to remove and readd the application to hooked apps list if you changed any settings in the Resorep UI. Going to fix that soon. Please remove all hooked apps from Resorep UI and add them back after update. It is back to the previous problem again, it crashes during loading of the client. btw where is the temp files saved for the reso? the dir was saved even when i deleted all the files in the Resorep and i tried looking in the windows local folders i couldn't find it. Naduron, could you please add BlackDesert64.exe to hooked applications list, launch the game and send me the contents of your bin64 folder after that? I will try to reproduce and fix the issue. Thank you. I think I know a possible reason. You are probably using 32-bit Java Runtime Environment. That's because the link to download Java that I provided by default leads to 32-bit version. On 64-bit Windows the System32 folder contains 64-bit dlls. But for 32-bit applications requests to System32 folder are transparently redirected to 32-bit version of the folder. If you are using 32-bit Java the Resorep sees 32-bit d3d11.dll in System32 folder and uses it instead of 64-bit d3d11.dll. Open Windows\System32 with Windows Explorer (it's 64-bit app) and copy d3d11.dll from that folder to any location. Launch Resorep under 32-bit Java Runtime Environment and point it to this 64-bit d3d11.dll. after that just in case remove and readd BlackDesert64.exe to hooked applications list. Later today I will fix the Java link in readme and instructions to point to 64-bit Java Runtime Environment. Hiya, I'm trying to use your new program in Win10 and get stuck at step 5. PrincessNicky, there should be a *ui.log file near resorep.jar. Could you please send it to me or post it here? Do not add any hooked apps to hooked apps list. Set all other settings in UI. Copy 64-bit d3d11.dll from system folder to BlackDesert64.exe file's folder. Copy dx11proxy64.dll to BlackDesert64.exe file's folder. Copy dllsettings.ini from resorep folder to BlackDesert64.exe file's folder. 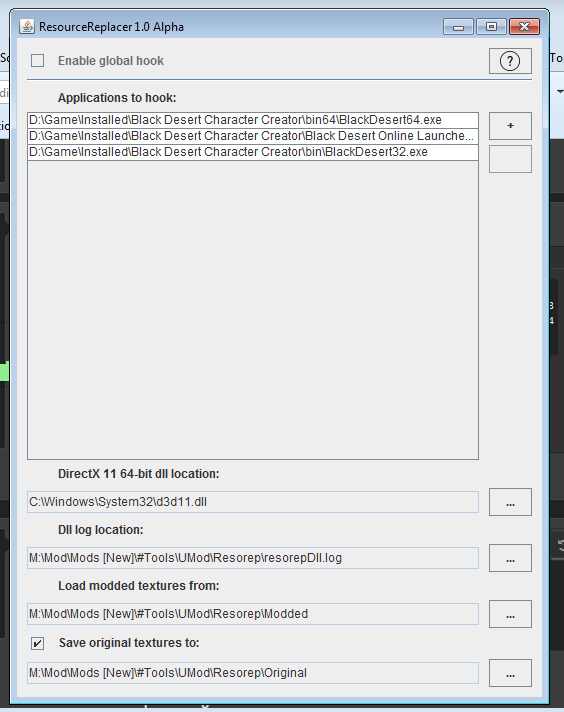 If that helps you may change hook settings by manual editing of dllsettings.ini in BlackDesert64.exe file's folder. There's no such file as dx11proxy64.dll anywhere on my PC. ui.log sent to you via PM. Hmm every time i use the Reso on the BDO so does that error keeps pop-up even tho the Reso has been turned off. I must re-install the BDO to fix the error.